I’m always hesitant to donate paintings. There’s a lot of talk about if it’s feasible as a tax write-off, or just good for business to get your name out there. I have no idea if it makes sense or not from a business standpoint. BUT, as an animal lover I don’t care – I’m happy to help in whatever way possible. 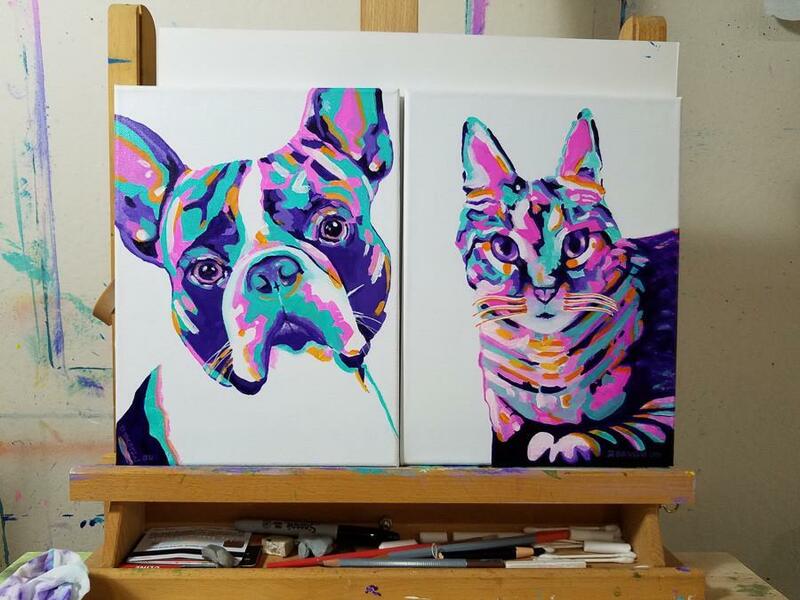 These are 12″ x 9″ and will be used for a silent auction to benefit Paws For Love & Pets Are Loving Support. As mentioned in my facebook post, painting these in my colorful purple, teal, pink and orange palette, made it fun. I’m not a traditional painter who’s into realism, for me; that’s what camera’s are for. That’s not to say that I don’t admire those that paint that way – it’s just not my preference, it doesn’t excite me like painting with vibrant colors do. Since I’ve never painted animals in this style before, it was a challenge to get the tonal values correct. So, I did small studies on 5×7 panels before finally executing on the canvas. In the end I’m happy with these and am amazed at how much fun it is to paint animals in these wild colors – who knows, may have to do more! Off to a good year, sold another painting last week – this one through Artfinder. For those of you who asked about the different online art venues, I’ve sold slightly more through Saatchi Art. Artfinder has also changed their commission structure (35% same as Saatchi), but now imposes a membership fee. If anyone is interested in the differences and my experiences with these two – let me know I may write a comparison. Though I’m not a huge seller at either, I can offer some tips, so let me know. 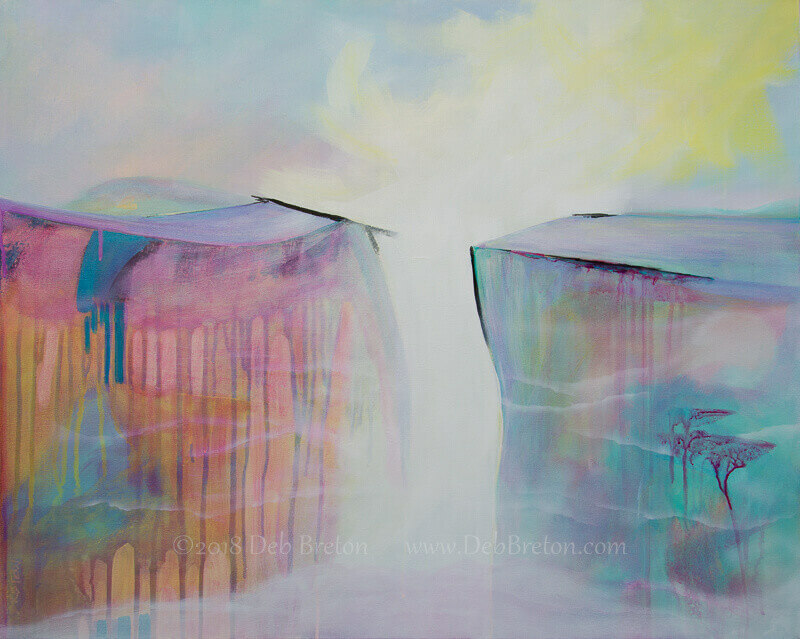 On The Precipice – Mixed Media on stretched 24 x 30 canvas with deep 1.5″ sides painted white. Surreal Abstract Landscape by Deb Breton. Pastel colors and bold drips with whispy clouds. Have always loved the dreamy feel to this painting. It’s one of the ones that came through me, more than really of me – if that makes sense. I’ve been putting some long hours lately, am not complaining, just finding it harder to blog these days. Right now if you’re interested in a commissioned painting my wait list is 2 months. But it will be here before you know it – so feel free to reach out to me and maybe we can co-create something beautiful together! Congratulations on the sale – sounds like your busy with work.